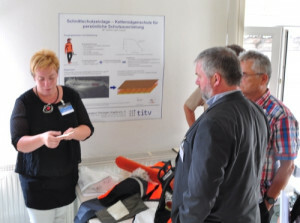 Over 100 participants from the industry, science and politics attended the 11th TITV-Innovationen 2018. The event focused on transferring the research results of the projects of the institute. The aim of this day was to experience innovation in an impressive manner. The event was integrated in the nationwide event Zuse-Tag Regional that takes place at 30 locations with the participation of over 60 institutes of the Zuse community. This year the topic “Smart Textiles” was a special focus of the projects of the institute. Closely surrounded by the participants, the engineers presented their new development, the e-Web, in the Maker Space. In order to make research transparent and understandable, the visitors were motivated to participate. Light and flexible textile sensors are the solution, when weight reduction plays an important role. 3D-textiles offer space for the integration of sensors and they feature the elastic restoring force that is necessary in many applications. Therefore, textile based sensors sensing the contact pressure and the temperature and the corresponding contact options were presented. For the time- and cost-efficient production of highly conductive textile structures, it is necessary to have the corresponding technologies. The first results of experiments in digital printing technique showed that it is possible to create highly conductive prints of a durable quality. Furthermore, new textile materials open interesting application fields for generating energy. Energy from smaller watercourses generated with small and modular hydro water plants is the target of the growth core project “Flussstrom plus”. Especially for small hydropower machines they developed a new, universal dynamic pressure water wheel with textile wheel blades to generate energy. For enhancing the efficiency of cut protection of work wear, another project tested knitted spacer fabrics. The integrated standing weft threads in the 3D knit fabric stop chainsaws in just a few milliseconds. Physiological tests on garments showed an optimized wearing comfort for both, weight and breathability.